All across campus, Missouri S&T professors — and their students — are conducting research that could have implications for future space travel. Reza Zoughi, center, and Tayeb Ghasr, right, pictured here with Jeffrey Birt, technical assistant in electrical and computer engineering, have developed a microwave camera you can hold in your hand and use to noninvasively capture 3-D images of the interior of structures. Researchers in Missouri S&T’s Applied Microwave Nondestructive Testing Laboratory (amntl) have developed a handheld microwave camera that noninvasively captures high-resolution 3-D images of the interior of structures in real time, like a video camera. The device was developed by Reza Zoughi, the Schlumberger Distinguished Professor of Electrical and Computer Engineering and amntl director, and Mohammad Tayeb Ghasr, MS EE’04, PhD EE’09, associate research professor in electrical and computer engineering. The camera can be used to inspect composite structures and thermal insulating materials used in aerospace and space vehicles, or in space habitats. It also has more down-to-earth potential applications, such as detecting and monitoring a variety of skin conditions and screening in airports and sports venues. Hank Pernicka, right, and his research team is working with the U.S. Air Force to launch two student-designed microsatellites into orbit. Launching soon from a NASA space station near you: an experimental satellite designed and built by Missouri S&T students. 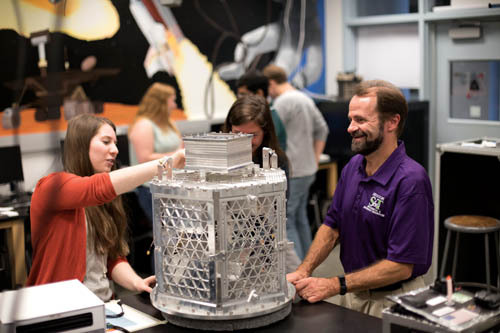 Research teams supervised by Hank Pernicka, professor of mechanical and aerospace engineering, are working on three spacecraft projects with both the federal space agency and the U.S. Air Force. The most promising effort consists of two microsatellites and is expected to launch from the International Space Station as soon as late 2018 after winning a 2015 Air Force competition. Bill Fahrenholtz, left, and Greg Hilmas examine a sample of ceramic material capable of withstanding extreme temperatures. Hypersonic vehicles like the U.S. Falcon, which is capable of flying 13,000 mph through the upper levels of the atmosphere, must be able to withstand ultra-high temperatures over longer periods of time than retired space shuttles or Apollo-style capsules. 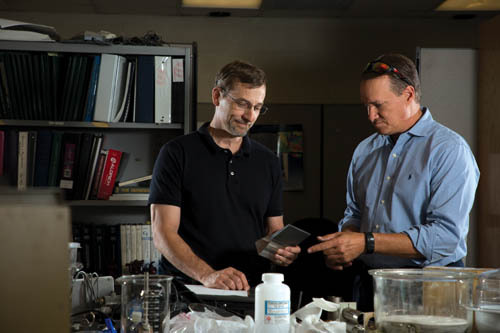 Developing materials to withstand those kinds of temperature extremes is one project in the Enabling Materials for Extreme Environments signature area, led by Greg Hilmas, interim chair of materials science and engineering, and Bill Fahrenholtz, director of the Materials Research Center. The two Curators’ Distinguished Professors of ceramic engineering are testing the thermal and mechanical properties of ceramics while developing methods to improve their performance. S&T researchers believe this spiral antenna will be a more reliable link between small satellites and ground stations. Building more reliable antennas linking small satellites to ground stations is the aim of Ali Foudazi and Atieh Talebzadeh, husband-and-wife Ph.D. students in electrical and computer engineering. The couple, joined by Matthew Dvorsky, EE’17, of Peoria, Ill., were finalists in a student design contest sponsored by IEEE. 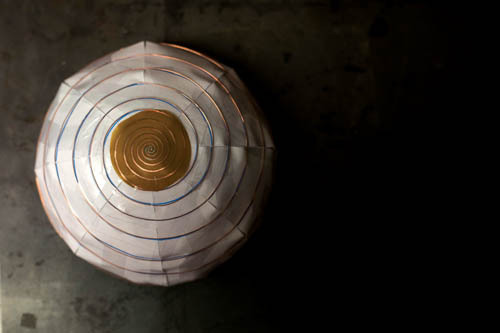 They developed a spiral antenna with a broad frequency range and the widest possible bandwidth that can be folded into a balloon attached to the satellite. Once in space, the hemispherical antenna unfolds to its full size upon release.